Beauty Professor: Attention Southern CA Locals: Clinique Special Event 6/26/15! Attention Southern CA Locals: Clinique Special Event 6/26/15! 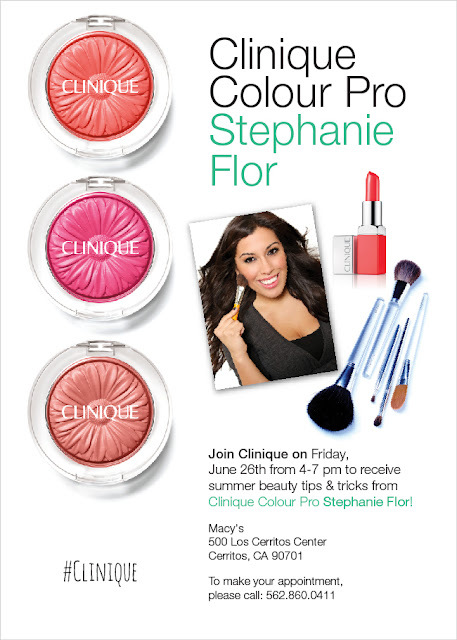 If you are in the Southern CA area tomorrow (Friday 6/26) from 4-7PM, consider swinging by the Macy's at the Los Cerritos Center to meet celebrity makeup artist and Clinique Color Pro Stephanie Flor, who will be sharing summer beauty strategies at the Clinique counter! Above: Clinique Cheek Pop Blush in Melon Pop, a delicate peachy coral...full, swatch-heavy review forthcoming! I have been intrigued by the Clinique's latest releases, especially the Cheek Pop Blush (pictured above and reviewed HERE) and Sculpting Highlight Chubby Stick in Hefty Highlight (reviewed HERE) and invite you to take a peek at the entire collection tomorrow. Hope to see you there! Fresh Friday post--focused on beauty, skincare and style--live on Beauty Professor at 11:00 AM PST!